Tim FitzHigham’s brand of witty comedy derives from his skills as a raconteur and his passion for unearthing the most curious historical facts from the 18th & 19th centuries. Not satisfied with giving us the information in an entertaining manner, he has recreated some of these odd events. This year he discovered from obscure records in gentlemen’s clubs the huge interest there was in setting the most bizarre wagers and he filmed his recreations as proof he actually carried them out. An example was the wager he had with the comedian Alex Horne that he could travel to London to Dover and back before Alex could write 1 million dots. They updated the rules with a bicycle being used instead of a horse, and a felt tip was used instead of a quill pen. As to who won the wager, it would spoil the show if I revealed the answer. Other bizarre wagers included pulling a rope with a weight attached over a distance of one mile, and pushing a wheelbarrow on a journey from Hertfordshire to Shoreditch as first attempted by Goliath Shadbolt in 1789. What a name that is! As his interest in taking wagers increased, the rush of excitement became an obsession which could have led to financial ruin. Therein lies the danger of betting whether it affects the individual or all of us in terms of the dealings on the stock market. 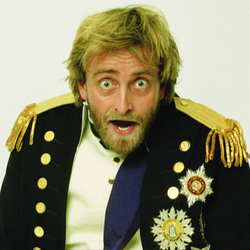 Tim FitzHigham is one of the most animated and eccentric comedians in the Fringe. Words pour out as his enthusiasm almost overwhelms him and this gives his performance great charm.